Welcome to the Robert Rothschild Farm Blog! Robert Rothschild Farm began in 1976 when Bob and Sara Rothschild moved from the San Francisco Bay area to Urbana, Ohio to begin a pick-your-own berries business. During the 1984 harvest, the decision to create red raspberry preserves from the excess berries launched an enterprise that still flourishes today. 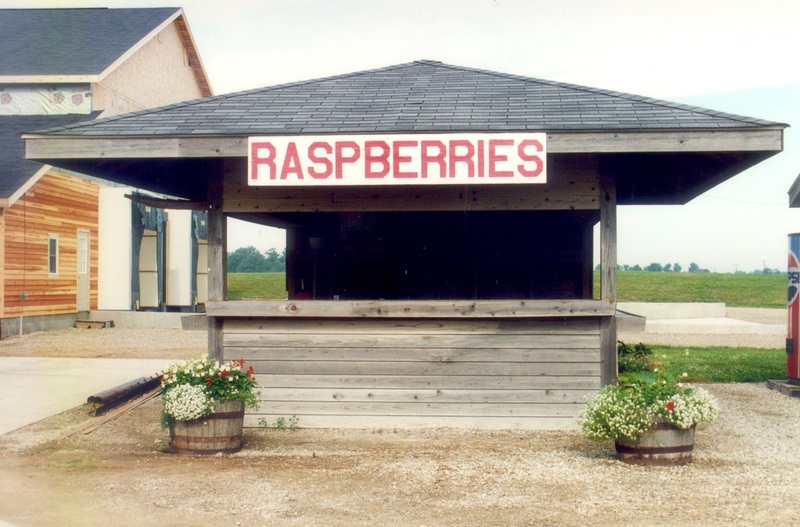 The first raspberry stand at Robert Rothschild Farm. Robert Rothschild Farm produces more than just red raspberry preserves these days. Our gourmet products include award-winning dips, sauces, condiments, baking mixes, oils, vinegars and much more! Some of our most popular products include our award-winning Raspberry Honey Mustard Pretzel Dip and Roasted Pineapple & Habanero Dip. Our Raspberry Honey Mustard Pretzel Dip combines rich honey and tangy mustard with sweet red raspberries for a creamy dip. The versatility of this dip is what makes it truly extraordinary. Simply open and serve for a delicious snack, glaze chicken for a sweet twist, or bake with chicken, artichokes and cheese for a delightful spread. Our award-winning Raspberry Honey Mustard Pretzel Dip featured with Raspberry Artichoke Chicken Spread. Our popular Roasted Pineapple & Habanero Dip is a unique flavor combination. Sweet roasted pineapples are blended with robust habanero peppers to create a sweet heat. This delectable dip can be poured over a softened block of cream cheese for an easy appetizer or used as a glaze for just about anything. Chicken Skewers with our popular Roasted Pineapple & Habanero Dip. Simply glaze and enjoy! Now that you know a little bit about us, we hope you enjoy clicking through our blog for the best in everyday gourmet! Please feel free to leave comments. We love hearing from you. For more information about Robert Rothschild Farm, visit our website: www.robertrothschild.com. Connect with us on Facebook, Pinterest, Twitter, and Instagram! I love Robert Rothschild products! My favorites are the mustards and the Dirty Martini Dip. #topdipgiveaway I have been a fan for the last two years. I can’t go on enough about your wonderful products. It’s gourmet ingredients and really shows the labor of love you put into your products! I live in Nova Scotia. When I call to order the staff is always so friendly. If you are having a sale because I can’t do freight shipping online you always honor the sale and treat me fair! OMG! I put the Toasted Garlic Horseradish Dip on hot pasta & it was to die for!!! I am trying to purchase the Triple Berry Pie filling…Is it discontinued?? Yes, unfortunately we did discontinue the Triple Berry Pie filling. I bought a jar of your Asian Teriyaki sauce at an Omaha Steak store and used it in a stir-fry recipe. Most delicious. Do you have any other recipes I can use it in? This sauce is also great for meatballs and used as a simmer sauce for meats and vegetables.